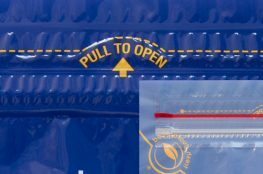 BacStop™ Microbial Control film - Polymer Packaging Inc.
Polymer Packaging introduces a new low-cost microbial control flexible packaging film converted into bags, sheeting, rolls and pouches. Our microbial control film inhibits the growth of harmful microorganisms such as bacteria, fungi and molds. Initial testing has shown that BacStop™ inhibits growth of bacteria by 99.9%. What is the Shelf Life of BacStop™? BacStop™ is easily blended into the film so it does not wear off or leach out. We have conducted shelf-life testing with various food/drink products that does not show any microbial growth for 1-2 years. 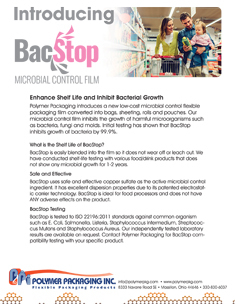 BacStop™ uses safe and effective copper sulfate as the active microbial control ingredient. It has excellent dispersion properties due to its patented electrostatic carrier technology. BacStop™ is ideal for food processors and does not have ANY adverse effects on the product. BacStop™ is tested to ISO 22196:2011 standards against common organism such as E. Coli, Salmonella, Listeria, Staphylococcus Intermedium, Streptococcus Mutans and Staphylococcus Aureus. 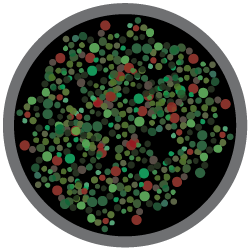 Our independently tested laboratory results are available on request. 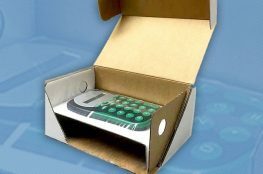 Contact Polymer Packaging for BacStop™ compatibility testing with your specific product. Non-BacStop™ drink pouch interior after 1 year. Drink pouches can start microbial formation as early as 9.4 months based on independent testing. BacStop™ drink pouch interior after 1 year. 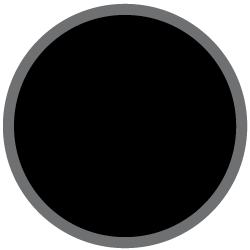 BacStop™ does not show any microbial formation after 1 year, which can dramatically extend your product’s shelf life and appearance.